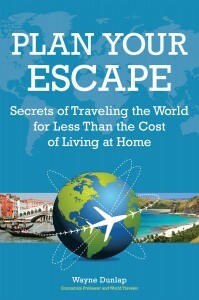 From a former Economics professor & experience traveler (100 countries), award-winning photojournalist/blogger, featured speaker at large travel shows, travel TV host (Plan Your Escape® TV), and travel columnist for the Huffington Post, the 5-star Plan Your Escape® has helped thousands of people travel and see more for half the cost for all trips from weekend getaways to longer vacations and trips, experience more adventure and romance with comprehensive planning tools & checklists, safely realize their travel dreams, and much more – see Book Reviews and 5-star Reader Reviews! 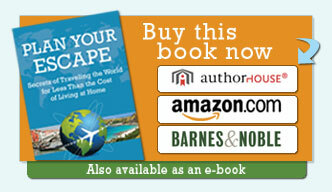 Plan Your Escape®, Secrets of Traveling the World for Less Than the Cost of Living at Home is a popular-selling, groundbreaking, and comprehensive step-by-step “how-to-do-it” travel book essential for turning your travel dreams into reality. It shows you how traveling or living elsewhere can be safer, easier, and more affordable than you think. Plan Your Escape® gives you the practical resources, comprehensive planning tools & checklists, and cost-saving bargains missing in travel guide books. The Dunlaps met scores of people along their world travel journeys who asked hundreds of questions. They realized many people dream of taking a traveling adventure but felt it would be too expensive with too many unknowns or didn’t know the best way how to pack or where to begin to make it actually happen. This detailed travel book combines real-life answers with countless hours of research from traveling experts. Plan Your Escape® addresses the concerns you may have as well as the ones you may yet be aware of. The Dunlaps rented their home and traveled the world for the past 3 years and are members of the exclusive Travelers’ Century Club. In total they have visited 100 countries and island groups on 6 continents as well as 44 U.S. states. They have done home exchanges and taken 31 cruises on 14 different cruise lines on ships ranging from 10 to 3,000 passengers as well as over 100 trips together taking cars, trains, buses, organized tours, and independent travel round the world. Traveling is their passion! You can contact the Dunlaps to give inspirational and informative Plan Your Escape® travel speaking engagements for your organization about great travel tips, bargain-finding strategies, and interesting stories. With these cost-saving tips and bargain-finding strategies worth 100′s of times the cost of this book, you can travel and see more for half the cost for your normal vacations and weekend getaways or stretch your typical holiday costs to cover a month or more of traveling. In many places in the world, you will learn how to go travel for less than a $100 a day for a couple! The experienced traveler will learn at lot. For those occasional and beginning travelers, Plan Your Escape® shows you how to start out slow, choose the right trip for you, and work up to a longer trip or stay. Plan Your Escape® is the travel-planning guide Americans need. You deserve safely realize your travel dreams. Plan Your Escape Now!